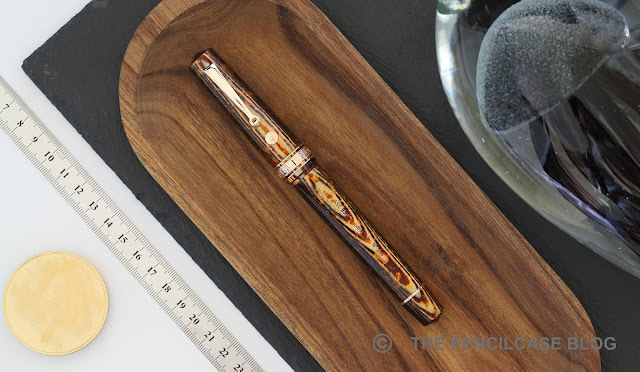 At some point when Omas was still in business, I came dangerously close to buying a Paragon in their iconic Arco Brown celluloid, but I passed on it and went with the - much less iconic - London Smoke finish instead. A decision I regretted when Omas went under shortly after. 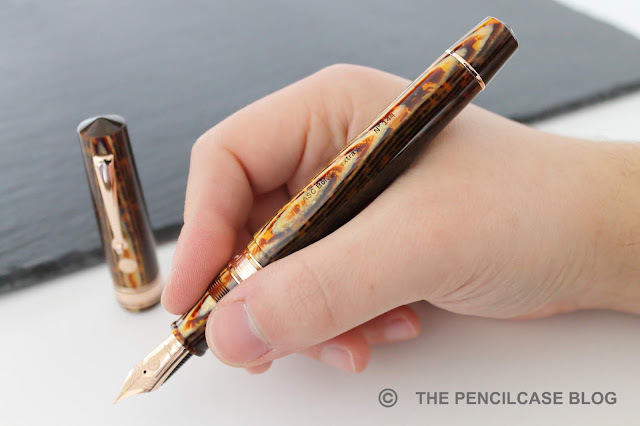 Armando Simoni Club (ASC in short) bought the remaining celluloid during the liquidation, and now makes their own interpretations of the old Omas pens. I knew this was my chance to get a piece of Arco. 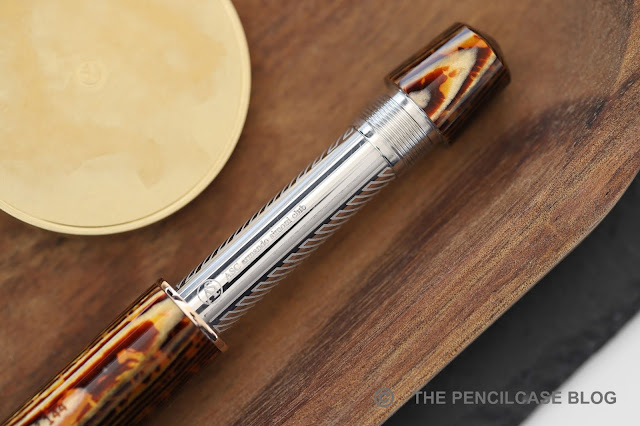 The ASC Bologna Extra fountain pen was one of only a few models that ASC released in this material, and due to limited stock, it has already been discontinued (For the time being it's quite unclear how much material - if any at all - is left, and if this exact model will be produced again later). 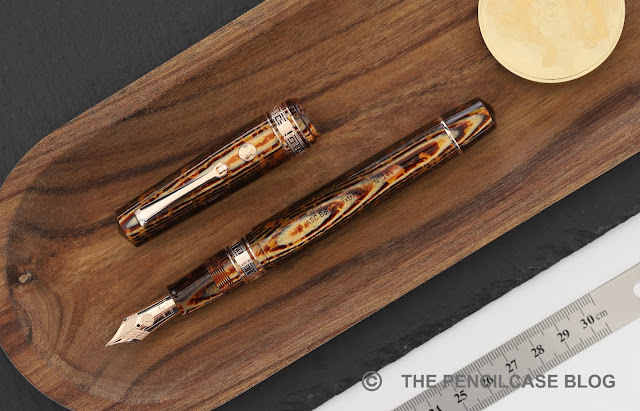 As the name suggests, the Bologna Extra is loosely inspired by the Omas Bologna. Resemblance to the Omas counterpart is - in my opinion - rather limited, but it does indeed share the same overall cigar shape, pointed flattop finials and round profile. Other than that, I think the ASC Bologna Extra looks more refined with a more elaborate decoration, and it is also noticeably larger (which is why ASC calls this the Bologna 'Extra'). The center band consists of a single wider band with the typical Greek Key motif found on many Omas pens, and is surrounded by two narrower rings. The clip - with the typical rolling wheel - is noticeably small for a pen of this size, and is accompanied by a small metal medallion right underneath it that sports the ASC logo. Interestingly, they went for rose gold plating on the trims of the Arco Brown model. I was a bit afraid that it would look gaudy in combination with the yellow hue of the Arco celluloid, but it actually pairs quite nicely. The round profile of the Bologna Extra does a pretty good job bringing out the intricate pattern of the Arco celluloid, and it shows the complexity of the material. I've heard people say that the material comes across better on faceted pens, but I don't think it looks particularly worse compared to the dodecagonal Omas Paragon pens that this material was most often used on. It's not difficult to see why Arco is such a sought-after material. The layered structure changes from a dark brown hue to bright gold, depending on the angle at which the material is cut, and the gold layers shimmer vividly when the light hits it. I wanted this pen mostly for the material, and it certainly did not disappoint. Regarding the material, there's one small detail that the OCD side of me didn't really like, is that the pattern of the material doesn't perfectly line up between all parts of the pen. Granted, this pen consists of 9 individual pieces of celluloid (including the small rings between the center bands), so I can imagine how hard it is to get them to align perfectly. The Bologna Extra is a very large pen. It measures 16 cm (6.3") and has a fairly wide diameter of 1.6 cm (0.62") at the widest point. Uncapped, it's still massive, at 14.7 cm (5.81"). 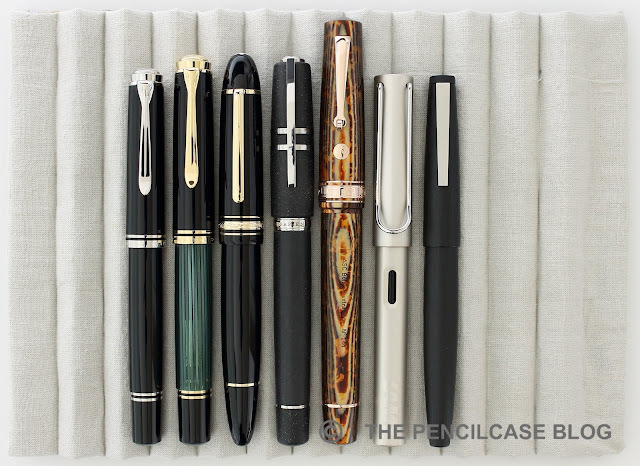 It gives a new meaning to the term oversized, as it dwarfs even the biggest of pens in my collection, such as the Montblanc 149 or Omas Arte Italiana Paragon. Additionally, the filling mechanism inside the barrel is entirely made of brass. This bumps up the weight to a massive 60 gram total, much heavier than you'd expect from a celluloid pen. Let's be honest, a large pen like this probably won't appeal to a very wide audience. I like oversized pens, but even I don't think this is a very practical pen for daily use. Case in point: Even finding a pen case that fits is a challenge (the Visconti Dreamtouch case is a tight squeeze!). Despite the size, the Bologna Extra redeems itself with excellent writing comfort. It's undoubtedly heavy in the hand, but the section is long and comfortably shaped. The transition from barrel to section has a small step that is hardly noticeable because it's quite far back, and the threads - despite being placed right in the middle of the section - are shallow. For me this is definitely a pen to keep on the desk. A collector's piece that's comfortable for relaxed writing sessions, but not ideal to take with you on the go. Identical to the Modern Wahl-Eversharp Decoband, the Bologna Extra utilizes a pneumatic filling system. As I mentioned earlier, the mechanism consists of a couple solid metal parts which add a lot of weight to the pen, and the ink capacity isn't massive (about 1.5 mL in my tests, a bit disappointing for such a large pen). It's also not the most practical filling system, nor the easiest to clean. But I'll give them credit for originality, it's not a filling system you come across every day on modern pens. 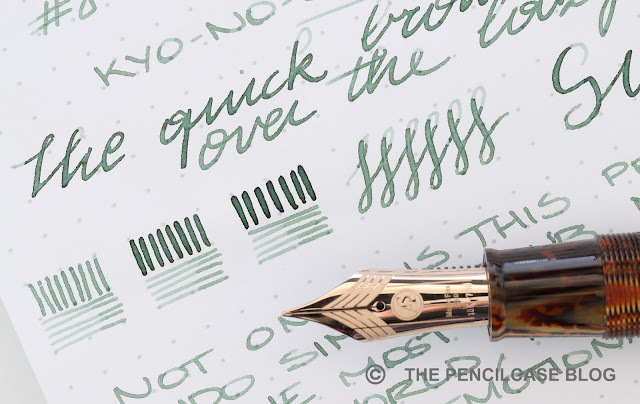 The ASC also shares a similar nib to the Decoband. It's a large #8 nib with an ebonite feed. 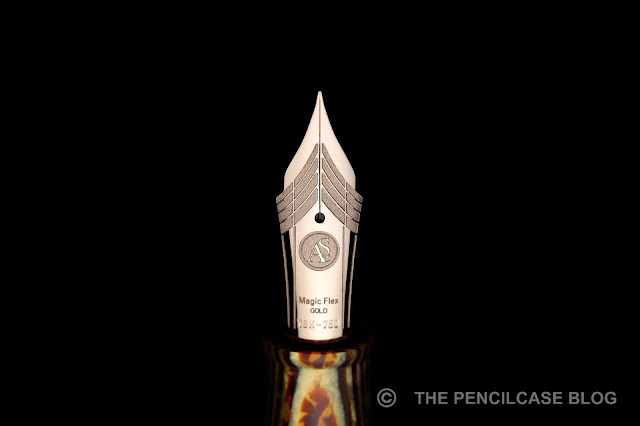 ASC calls it 'Magic Flex', so I expected it to be similar to Wahl's 'Superflex' nibs. But from my experience (I wasn't able to compare them side by side), this Magic Flex nib seems a bit less soft. They aren't really marketed for flex (so the name choice is perhaps a bit unfortunate), but the nib IS soft and a little pressure gives rise to a respectable amount of line variation. Being 'one size fits all', you get the choice of fine, fine or... fine. I did find some variation in nib width between multiple pens, and my nib was originally more like an EF so I sent it back for a nib exchange a few weeks after I bought it. Since I got my pen at a local brick and mortar store (Sakura Fountain Pen Gallery), the nib exchange was taken care of for me, but it did take a while (about 4 months!). The exchanged nib is a bit wider, something along the lines of a Western fine-medium, which is in line with what I expected. It's fantastically smooth and easily one of the best writers in my collection. 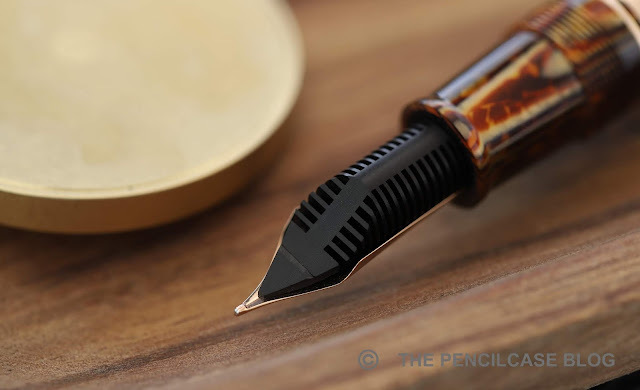 The nib is responsive, and the special two-part ebonite feed 'flexes' along with the nib to keep a steady and consistent ink flow. It's definitely a very wet writer, to the extent that I actually prefer to use slightly drier inks to balance things out. As you can expect, the combination of a wet nib and rather limited ink capacity does mean that you'll end up refilling it quite often. There's also no ink window, so you never really know how much ink you have left. There's a lot to love about the ASC Bologna Extra Arco. I think the design is great, and the imposing stature is a perfect canvas to show off the magnificent Arco material. Granted I had to get the nib exchanged, it is now one of my absolute favorite writers. It may not be a modern flex nib, but it's fantastically smooth and the softness gives character to my writing. 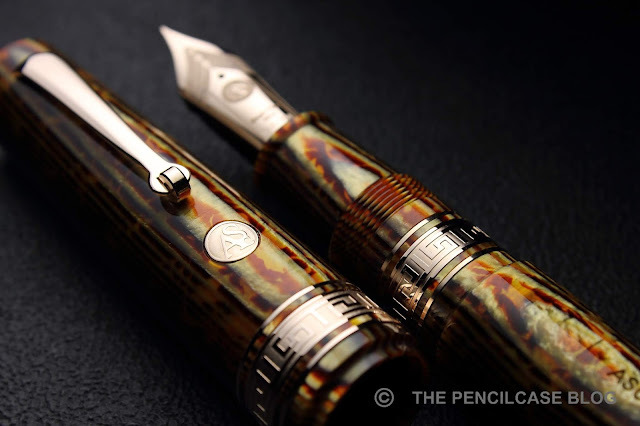 At 1250$, the ASC Bologna Extra is an expensive pen, there's no way around it. Quite simply, you pay a hefty premium for the fact that ASC currently holds a monopoly on the Arco material. Then again, I wanted this pen specifically for the material, and solely for that reason it was 'worth it' for me. The bad news? Unfortunately the Arco Brown version has already sold out, and there's no telling if there will ever be more. The Arco Verde, and a few other celluloid versions of the Bologna Extra can still be found in certain stores (Sakura FP Gallery still has them in stock), though they are also selling out fast. It certainly makes me wonder what ASC will come up with next, after they run out of their stash of Omas celluloids? Disclaimer: I bought this pen from my own funds, this review was in no way sponsored or influenced. This post does not contain affiliate links. Excellent review - I have a number of ASC celluloid pens that I really enjoy but customer service in the US is practically nonexistent. Email to info@ascpens.com for service over three weeks has not had a single reply. Two attempted purchases of “In Stock” Verde pens sat for two weeks without shipping or reply before we finally received one email “Getting it ready to ship” followed a day later from Elizabeth offering other models because they had sold out Verde at the last pen show (which we ordered before). Nobody “needs” a rushed fountain pen perhaps but this is just poor business practice and no service after the sale of $1250 pens. These we’ve learned are far from uncommon experiences. Perhaps consider buying from a reputable dealer who can get ASC’s attention or who will be an effective, responsive support for you. Agreed, in this case (and unfortunately it's far from the only brand with customer service issues) it's best to go via a B&M or reputable online store. I was very glad that I bought mine at a local store so they could handle the nib exchange for me!